The Geneva 2 Conference failed, first, because the United States decided to support the Saudi position rather than honor their signature on the Geneva 1 communiqué and, secondly, because it was chaired by Lakhdar Brahimi was not an impartial broker but served precisely Washington instead of seeking peace. On the advice of Russia, Syria had accepted that the special envoy of Ban Ki-moon would chair the sessions. Moscow hoped at the time that Washington would keep its promises. 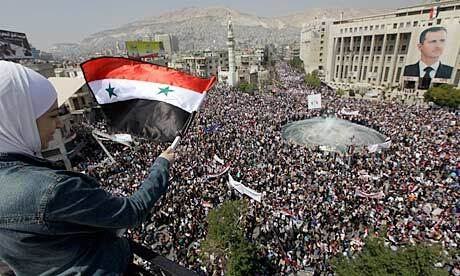 Damascus remembered that twenty-five years earlier, at Taif, Brahimi had not been an opponent of Syria. However, the vote by the U.S. Congress granting funding to Al-Qaeda at a secret meeting , the lack of legitimacy and authority of the delegation of the Syrian opposition, the cancellation of the UN invitation to Iran on the eve of the conference and the keynote speech by Secretary of State John Kerry heaping all the responsibility on Syria , not to mention the hurdles put by the European Union to physically prevent the Syrian delegation from travelling to Switzerland  showed that Moscow had either miscalculated or been deceived. The Montreux session was exclusively designed to put Syria in the dock, making it fall into a trap. Indeed, the United States had itself drafted the statement by the opposition and released two days earlier a supposedly independent report – actually a hoax sponsored by Qatar – comparing Syrian prisons to Auschwitz . Though Walid al-Muallem reasonably addressed Syrian public opinion, John Kerry and his allies, for their part, spoke to the rest of the world to impose their propaganda. The Geneva talks were an opportunity for Lakhdar Brahimi to frame Syria’s inflexibility and to blame her for the war of which she is the victim. Thus, in the eyes of the world, the victims became the executioners. He allowed talk about terrorism, while all the same time evoking the issue of transitional government. Then he accused Syria of not playing the game even though the discussion on terrorism had resulted in the clear endorsement of the “opposition” delegation of the abuses perpetrated by the jihadists. Since the U.S. shieft, Lakhdar Brahimi has transformed himself into a relentless accuser of Syria. On March 14, before the United Nations General Assembly, he accused her of turning down international humanitarian aid and of starving her own people . He presented the situation in Yarmouk Camp as Syria’s deliberate intent to starve the Palestinians, ignoring that the Palestinian Authority supports Syria and has thanked her for what she is doing in Yarmouk. Above all, he never ceased to assert that the conflict was between the government and some of its citizens and could not find a military solution. This is concealing the West’s ten-year involvement in prepararing for this war, the way in which they triggered it by sending snipers into Deraa and spreading disinformation about the torture of children. It is also ignoring the presence of foreign fighters, even though Mr. Brahimi had previously admitted they were at least 40,000. Even though this figure is three times lower than what it actually is, it is enough to indicate that this is a war of aggression comparable to that that suffered Nicaragua in the 80s. In retrospect, it appears that Syria was wrong to follow Russia’s advice and trust Lakhdar Brahimi. His appointment was in itself a foreboding of the failure to come: while his predecessor, Kofi Annan, had resigned, saying the mission impossible due to the division of the Security Council, Brahimi himself had accepted it with a smile. 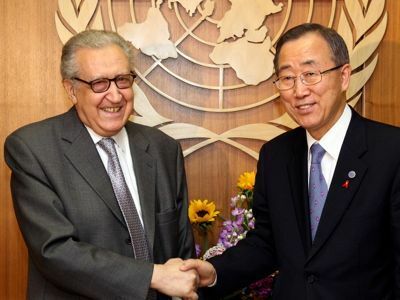 Then, Lakhdar Brahimi had combined his role as Special Envoy of the UN Secretary General with that of Special Envoy of the Secretary General of the Arab League, from which Syria was improperly excluded. He was therefore judge and jury. At the time of Brahimi’s appointment in August 2013, I wrote an article about his past and submitted it to a major Syrian newspaper – I did not yet have the privilege of writing for Al-Watan. I reported his engagement in 1992 among the ten members of the Algerian High Security Council . This so-called champion of democracy then annulled the results of democratic elections, forcing President Bendjedid to resign, placedjanviéristes generals in power triggering a terrible decade of civil war, which the Algerian people still bear the scars and from which only the United States profited. 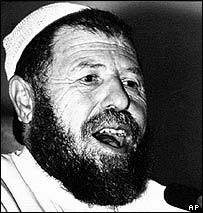 At the time, the leader of the Algerian Islamists, Abbasi Madani, took the pseudo secular Syrian, Bourhan Ghalioun (future president of the Syrian National Council) as a political advisor. The armed Islamist faction GSPC (renamed in 2007 Al-Qaeda in the Islamic Maghreb) was trained in handling weapons alongside the Islamic Fighting Group in Libya (renamed in 1997 Al-Qaeda in Libya); most fighters of the two groups are today incorporated into the armed groups in Syria. Very worried about the consequences of these revelations, some Syrian officials opposed their publication. According to them, the dissemination of such an article would have been interpreted, including by Russia, as a desire to break away on the part of Syria. So I published it in Algeria, on Mr. Brahimi’s turf, in El-Ekhbar, the country’s second daily . It provoked a storm against him there. Let’s observe today the legacy of Lakhdar Brahimi : even before taking part in triggering the Algerian civil war, he had negotiated the Taif Agreement (1989) for the Arab League which divided Lebanon along religious community lines and which, today, make it anything but a sovereign state. Mr. Brahimi is also the one who negotiated the Bonn Accords (2002), installing the Kabul Karzai clan in power on behalf of NATO. Finally, as for the famous report – to which he gave his name – of the UN Commission he chaired for the Peacekeeping Operations  dedicated to “humanitarian intervention”, the new name for colonialism. Above all, he endorses the drift of the Organization which invented interposition troops to impose the peace of the great powers instead of observers to monitor the application of a negotiated peace between the parties in conflict. He advocated to base this global governance on a doctrine of intervention and a supra-national intelligence service called “Decision Support”, which Ban Ki-moon entrusted … to NATO . ” . Moreover, Mr. Brahimi has never been a “bargainer” or a “mediator” in the conflict. His mandate, signed by Ban Ki-moon, asks him to use his “talents and his extraordinary experience” to lead Syria to a “political transition, in accordance with the legitimate aspirations of the Syrian people . And “transition” here does not mean transition from war to peace, but from a sovereign Syria to an enslaved Syria without Bashar el-Assad. 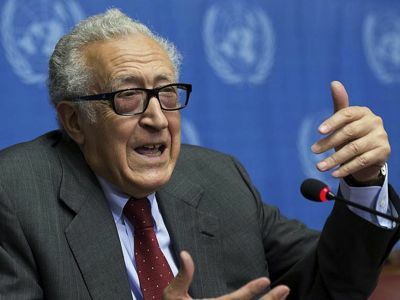 Lakhdar Brahimi, who presents himself as a former Third World militant, has never served the people of the Third World – not even his own – and has never broken with the major powers. He does not deserve the respect that we have accorded him. Updated 3:30 pm: A former senior Russian official who recently met Bashar al-Assad said the Syrian president told him the “active phase” of the war in Syria will be over this year but that the government would continue to fight “terrorists,” state-run Russian news agency Itar-Tass reported on Monday. Sergei Stepashin, who served as prime minister in 1999 under then-President Boris Yeltsin and now heads a charitable organization, met Assad in Damascus last week during a visit to the Middle East, according to Russian news reports. “To my question about how military issues were going, this is what Assad said: ‘This year the active phase of military action in Syria will be ended. After that we will have to shift to what we have been doing all the time – fighting terrorists’,” Itar-Tass quoted Sergei Stepashin as saying. Stepashin said they had also discussed economic cooperation between Syria and Russia, Itar-Tass reported. Russia joined the United States in organizing peace talks that began in January in Geneva between Assad’s government and its foes. But no agreement was reached and it appears unlikely a new round will start anytime soon, in part because of high tension between Russia and the West over Ukraine. Assad has lost control of large swathes of northern and eastern Syria to Islamist rebels and foreign jihadis. But the army, backed by forces from Lebanon’s Hezbollah and other allies, have driven rebels back from around Damascus and secured most of central Syria. The head of Hezbollah said in an interview published on Monday that Assad would stand for re-election this year and that he no longer faced a threat of being overthrown. Alert! Open War Vs. Syria in the Offing? c) the equipping of the US-supported, foreign mercenaries with the latest anti-aircraft and anti-tank weapons in time for a spring offensive – and partly to upset plans for a Syrian presidential election in April 2014. 3) March 15, 2014, marks the third anniversary of the covert war of aggression against Syria launched by western and regional powers through the so-called “Friends of Syria” Group. President Obama is impatient. His advisors predicted in March 2011 that the government of Syria would fall within weeks. Instead, virtually every sector of Syrian society has rallied to save the country from being balkanized into hostile statelets à la Libya, Iraq, Yugoslavia and Afghanistan. Russia, China, and Iran have remained firm allies. 4) The US empire is on the warpath. Fresh from a disastrous regime-change operation, utilizing extreme right wing and fascist forces, against the elected government in Ukraine, and an on-going destabilization campaign against the elected government in Venezuela, Washington policy makers are now demanding some results against the elected government in Syria. Stop the campaign of disinformation, demonization, and delegitimation against the government of Syria. In short, the peace movement in every country needs to tell its own domestic political leaders to keep their HANDS OFF SYRIA! Filed under: Al Qaeda, Geneva II, Humanitarian Crimes, Humanitarian crisis, ISIL, Mercenaries, Nusra Front, regime change, Russia, sanctions, Syria, USA, War Crimes and Criminals, War on Syria |	Comments Off on Alert! Open War Vs. Syria in the Offing? Where is the Russian US deal Stupid? “Saddam Hussein’s destiny or that of Kaddhafi awaits Putin‘, Thus dreamed “Mr. Bernard-Henri” Mazbout. “For this reason , the Lebanese Resistance has not waged war against its local sectarian enemies of 14th of March who work for Israel, and want the Resistance to surrender its weapons . On the contrary , it is trying to assimilate them, by forming a joint government with them, in order to spare the country a bloodbath and protect the Resistance .” he added, ignoring that he was against Syria going to Geneva 2, and denied the Syrian diplomatic media victory achieved there. The stupid avoided telling us, why the SAME Lebanon’s resistance who “has not waged war against its local sectarian enemies of 14th march who work for Israel“, has waged an open war, in Syria, against the same March 14th enemy and, (using his term), the “so called mercenaries brought from outside of Syria”. How he could at the same time, salute the wisdom of Hezbollah patience in Lebanon and salute its victorious wars in QUSAYR, and Yabrud. The world order has nothing to do with the Syrian crisis. Its all about reforms, freedom and democracy, and the regime failure to respond to peoples demands. The resistance axis should stop the war on the enemy within and immediately launch against the real enemy to liberate Golan Heights, Shebaa farms and Galilee. “This does not say anything good about the men who surround president Assad and who serve him , if all of them are like Batista, , this is a disaster and explains many things . .. Very soon Mazbout would claim that Alex is one of the men who surround Putin. Unfortunately Alex is not even one of those, because he don’t Live in Syria. He lived in Syria (196-1970), he failed to work in Syria. Thanks to Syrian Intelligence. Alex is an uprooted Palestinian who lived 7 years in Bentjbail (1948-1955), in Ein-elhelwi (1955-1965), In Nasser’s Egypt (1965-1969), in Qadhafi Libya (1972-1977)…. recognition as a sovereign state and called on Russia to integrate it into the Russian Federation. 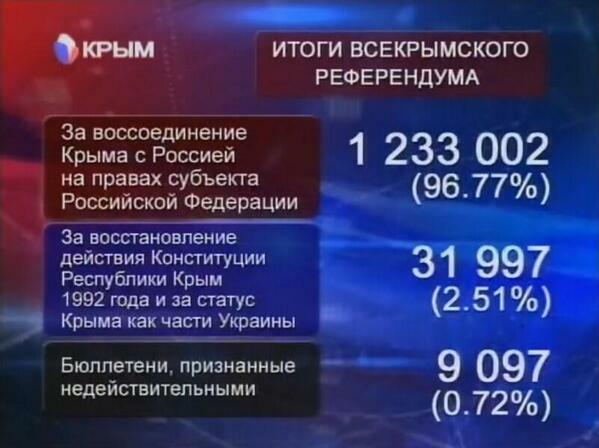 96.77 percent of the Crimean population voted ‘for’ the integration in a referendum. “The Republic of Crimea intends to build its relations with other states on the basis of equality, peace, mutual neighborly cooperation, and other generally agreed principles of political, economic and cultural cooperation between states,” the legislation says. 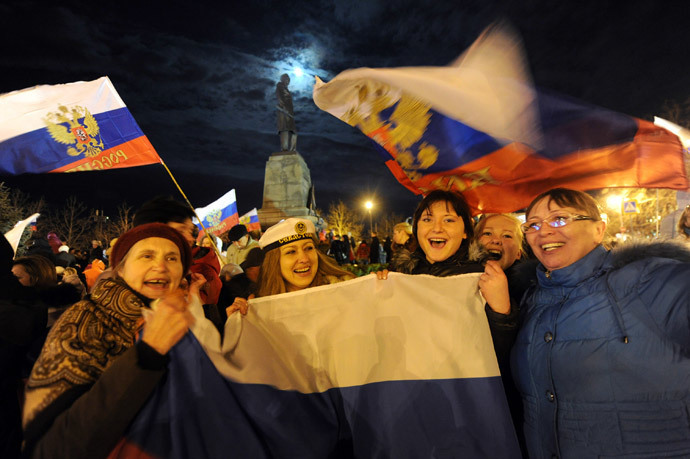 Crimea was declared an independent sovereign state, the Republic of Crimea, on Monday, the autonomous Ukrainian regional parliament’s website stated. The Supreme Council of Crimea unanimously voted to integrate of the region into Russia. Ukrainian military units on Crimean territory are to be disbanded, with the military personnel allowed to stay and live on the peninsula, Interfax reported Crimean Supreme Council chairman Vladimir Konstantinov as saying. “Those who, according to their beliefs, don’t accept the Crimean independence and stay true to the Ukrainian state won’t be persecuted,” the head of Crimea’s parliament Vladimir Konstantinov said, as quoted by ITAR-TASS. He added that the same principle will apply to government employees and security workers who took the oath of allegiance to Ukraine. His comments came after more than 500 troops left Sevastopol to register at temporary checkpoints. The Crimean Parliament also ruled that Ukrainian state property in the peninsula will become the property of the Republic of Crimea, Kryminform news agency reported. The Crimean Parliament will remain the supreme legislative body of the republic until September 2015, or until a decision is made to integrate Crimea into the Russian Federation. Meanwhile, Ukraine’s coup-imposed President Aleksandr Turchinov called the referendum “a great farce,” saying it will never be recognized either by Ukraine or by the civilized world,” AFP reported. It’s after the announcement of the official results: 96.77 percent of the Crimean population has voted ‘for’ integration of the region into the Russian Federation. The turnout was 83.1 per cent. President Vladimir Putin has signed an order that Russia recognizes Crimea as a sovereign and independent state. 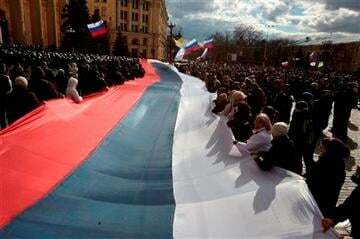 The Autonomous Republic of Crimea held a referendum on Sunday with over 96% voting for integration into Russia. “According to the will of the peoples of the Crimea on the all-Crimean referendum held on March 16, 2014, [I order] to recognize the Republic of Crimea, in which the city of Sevastopol has a special status, as a sovereign and independent state,” the document reads. The order comes into force immediately. Crimea was declared an independent sovereign state, the Republic of Crimea, on Monday, the autonomous Ukrainian regional parliament’s website stated. Crimea also addressed the UN seeking recognition as a sovereign state. “The Republic of Crimea intends to build its relations with other states on the basis of equality, peace, mutual neighborly cooperation, and other generally agreed principles of political, economic and cultural cooperation between states,” the parliament said. The Crimean parliament also unanimously voted to integrate the region into Russia. When Belgian Foreign Minister Didier Reynders visited Iran on February 22, 2014, the Iranians blatantly told him that the only solution in Syria would be to form a broad-based national unity government comprising of representatives of both the regime and the opposition, but under the leadership of President Bashar al-Assad. The European official also heard harsh words from the Iranians about the role that Saudi Arabia and Qatar have been playing in sponsoring terrorism. Iranian officials said that two Gulf countries, encouraged by the international community, were destabilizing the region and thwarting all efforts for peace in Syria. The Iranians also said that funding terrorist groups would backfire on Saudi Arabia and Qatar, and presented information, lists, and documents of their support for terrorists, mentioning that a brother of Prince Bandar bin Sultan was involved in funding them. On February 26, only four days after the Belgian minister’s visit, Qatari Foreign Minister Khaled bin Mohammed al-Attiyah arrived in Tehran. The minister, who has Syrian relatives, had started out his career as a fighter pilot, before he went into politics, business, and law. Because of his background, he probably understood that going to Tehran was not only mandatory now, but urgent. How couldn’t he have realized that when Doha has been receiving reports for some time that Saudi Arabia was planning to undermine the Qatari role and eliminate the Muslim Brotherhood’s remaining bastions? Qatar’s ambitions are justifiable, but its role was delicately drawn on its behalf. Riyadh allowed Doha’s ambitions to run their course. The kingdom encouraged, supported, and suggested that it was right behind Qatar. But as soon as the Qatari role in France suffered a blow due to its funding of terrorism in Mali, Saudi Arabia moved in to take its place. As soon as Qatar’s role in Egypt suffered a setback after the Muslim Brotherhood-led regime there was toppled, Saudi Arabia moved in to shower Field Marshal Abdel Fattah al-Sisi with money and support. Doha sent officials to Damascus and Tehran, but its overtures were not well-received. What is required of Qatar is much more than a few publicized visits. Two more blows came from Saudi Arabia. First, the ambassadors of Saudi, the UAE, and Bahrain were recalled from Doha. Then, the Muslim Brotherhood was designated by the Saudis as a terrorist organization. The media outlets funded by the two countries then proceeded to take part in the worst dispute in the history of their relations. Iran is waiting, and so is Assad. The first is famous for its diplomacy and patience. The second brings in a military option that has started to turn the tide of the ongoing war. The Qatari foreign minister went to Iran to offer a comprehensive deal that is currently under consideration. The Qatari position on Assad remains rigid, but everything is now up for discussion. Qatar’s financial and moral contribution in securing the release of the nuns kidnapped in Syria is significant. The same can be said about other similar developments, even if the details of which have not been fully publicized, including Qatar’s recent move to curtail its support for armed groups. Those details will come to light in the near future. On Sunday, Europe’s foreign policy chief, Catherine Ashton, heard from Tehran the same things her Belgian counterpart was told during his visit: the fight against terrorism is a priority, there must be a political solution in Syria based on the premises mentioned earlier, and there must be good faith on the nuclear issue. Everything else can be discussed. Ashton’s response was more than encouraging to Iran as she said she was carrying a message of goodwill from 28 European countries. Ashton affirmed that by overcoming this stage with Iran will allow them to address more strategic issues down the road. Tehran is aware of Europe’s need for making compromises. In Iran’s line of thinking, this is acceptable, so let it be the starting point and the bargaining chip that it can use with the Obama administration. Iran’s warm reception of Ashton, and other European officials, is important and deliberate. It was followed by an equally warm reception that the U.S. extended to Benjamin Netanyahu, the Israeli premier who is pathologically obsessed with Iran. Assad does not want July’s presidential elections to take place without first being in control of major cities – including Aleppo. The P5+1 negotiations are progressing. The Syrian army, in parallel, is making progress on the ground. Yabroud has all but fallen, whether through negotiations or by force. The decision to retake it was made a while ago, yet without haste. Other strategic regions might fall to the regime as well. Assad does not want July’s presidential elections to take place without first being in control of major cities – including Aleppo. Washington and Tehran have been trading accusations during the negotiations, but this is to be expected. Obama needs this to silence the Israeli lobby in Congress and reassure Israel. Tehran needs it to ease the hard-liners’ attacks on the negotiators. The decision regarding the “gladiator’s flexibility” made by the Supreme Leader is irreversible, unless it proves to be detrimental to Iranian interests. So far, Tehran has gained much more than it expected in 2005. Iran is testing the West and vice versa. This is what is at heart of the coming shifts in the region. If the negotiations succeed, many things will change. Meanwhile, Saudi Arabia is worried and justifiably so. The issue has to do with its future role on the international arena. Iran is now a cornerstone in the war on terror. Therefore, it was necessary for Saudi Arabia to make a public volte-face shortly before Obama arrives in Riyadh this month by putting several organizations it once funded on its terrorism list. The Iranian-European negotiations also include Gaza and the future of Palestine. Western powers realize that Tehran is not negotiating over the principle of resistance and settlements, and the Europeans have begun sounding the alarm over the humanitarian crisis in Gaza. Ashton spoke about the dangers of the Israeli blockade and the continued closure of the crossings on the Egyptian border. She said that Gaza must be taken into consideration during Palestinian-Israeli talks. The Europeans are preparing to offer what they call an “unprecedented package” for both the Palestinian and Israeli sides. This presupposes an agreement between them. Do all these things allow Iran and its allies to be optimistic? Not quite. What if Western negotiators ask Iran to take additional measures not stipulated in the NPT? The “gladiator’s flexibility” will vanish, or turn into a showdown. What if nuclear inspections end up allowing NATO to spy on Iran’s conventional weapons? This is a possibility. What will Iran do with the law it passed in 2005, requiring the construction of 20 nuclear reactors for civilian purposes? These will all need uranium enrichment. What if Saudi Arabia and Western countries decide to transfer more harmful weapons to Syria in an effort to overturn the balance of power and try to take Damascus once again? And what if Israel ventures to undertake military action for the same purpose? All of these questions are on the table. Yet the European Union is looking for a way out of such predicaments. For instance, European mediators proposed the idea of forming an international group to supply Iran with the nuclear material it needs. They believe that this would meet Iran’s needs while encouraging it to abandon uranium enrichment. Iran has yet to approve and hasn’t suspended production of heavy water in the reactor in Arak. Western powers fear this could help Iran produce plutonium, which can be used to make nuclear weapons. The tug of war continues. The Belgian minister, and then Ashton, proposed to integrate Iran again into the Geneva 2 talks. Tehran had moved negotiations from Geneva to Vienna, to protest the Western position on Iran in Geneva. Iranian Assistant Foreign Minister Hussein Amir Abdul-Lahian proposed to a European foreign minister to mediate with Syria over humanitarian issues, and to create a joint Iranian-European-Syrian follow-up committee. The Iranians said that they were extending assistance to Syrian refugees, especially in Jordan and Lebanon. 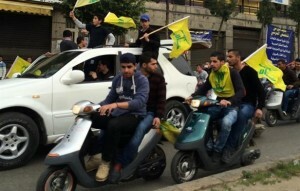 The Iranians also spoke about their role and Hezbollah’s in brokering reconciliations in Syria. There were also discussions over possible cooperation between the Syrian Red Crescent and the European Red Cross. These strategic developments involving Iran and Europe coincided with an increasing Iranian-Turkish rapprochement. Recep Tayyip Erdogan is in need of Tehran, amid his feud with former ally and present enemy, preacher Fethullah Gulen. There were also talks with Russia recently to safeguard the rights of the Tatar minority in Ukraine. Qatari-Turkish-Iranian meetings, even ones involving Russia too, are no longer far-fetched. So how will this be translated on the ground in Syria? Things are clearer than before. Iranian Foreign Minister Mohammad Javad Zarif will hold further meetings with Ashton until July. By then, it would be time for Syrian presidential elections. Things in Ukraine will be clearer too by then: Either they will deteriorate further inviting more firmness by Vladimir Putin, or there will be de-escalation, bringing about better conditions for broader negotiations. The Europeans told Tehran that they were not enthusiastic about escalation with Putin and were inclined to seek settlements. Also, the military situation in Syria would have become clearer by then. Everything therefore indicates that the coming months will be crucial, critical, but also full of promising possibilities. Washington, (SANA) US State Department announced Wednesday that Washington decided to impose restrictions on Syria’s Permanent Representative to the United Nations Bashar al-Jaafari within a 40-km radius of New York City. This step indicates Washington’s fear of the success achieved by the Syrian diplomacy in terms of divulging the conspiracy hatched against Syria. “We have delivered a diplomatic note to the Permanent Representative of the Syrian Mission to the United Nations in New York informing him that … he is restricted to a 25-mile travel radius,” said State Department spokeswoman Jen Psaki. Paski’s allegations that “Some other countries’ UN envoys face similar restrictions including Iran and North Korea envoys,” do not justify such a move as no UN sanctions are imposed on Syria. This step also poses questions in terms that the USA utilizes the presence of the UN HQ on its territory for restricting the work of the diplomatic missions of the UN member states.